There was a bit of histrionics going on shortly after the 360 launch over privacy from people who apparently couldn’t work out how to turn on the privacy options, but I’ve come across undeniable proof that the amount of information that Live gives out on your current activities could be incriminating. Names have been obscured to protect the perverted. Telling everyone what game you’re playing or your current score is one thing, but this is going too far and people can go to prison for this kind of thing. 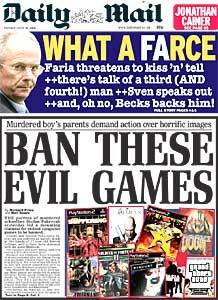 I just hope the Daily Mail doesn’t catch wind of this underground of paedophiles hiding in our gaming community and start up another banning campaign. Previous PostNew DVD PlayerNext PostHD-DVD or Blu-Ray?